Mountain Valley Pipeline LLC sent out letters threatening legal action against property owners who refused access to their land for surveying. Groups opposed to the pipeline believe there is no basis for legal action. The issue appears far from black and white. 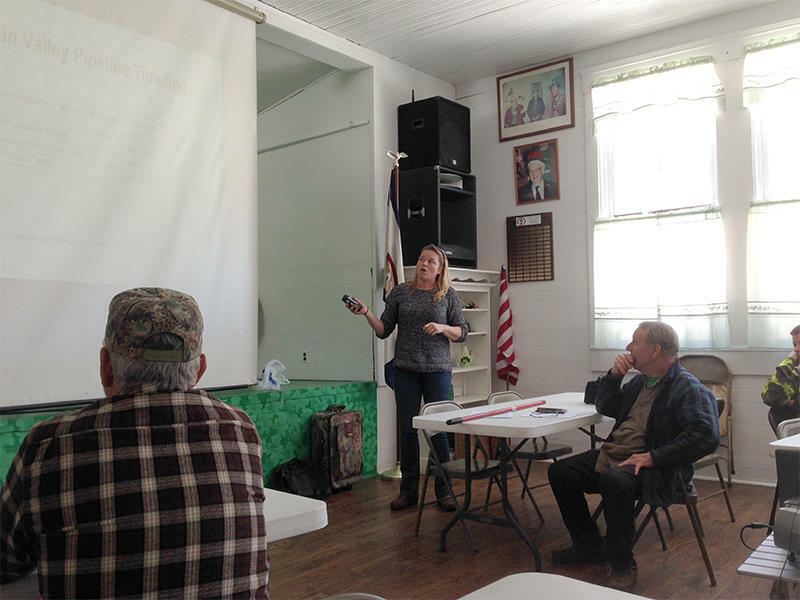 Elise Keaton, with the Greenbrier River Watershed Association, talks about the proposed Mountain Valley Pipeline during a Feb. 28 meeting at the Ireland, W.Va., Community Building. The Mountain Valley Pipeline, or MVP, is a proposed 42-inch diameter, 330-mile line that would connect hydraulic fracturing operations in West Virginia to a transmission pipeline in Virginia. EQT and NextEra Energy are partnering on the project. Elise Keaton is with the Greenbrier River Watershed Association, which is opposed to the Mountain Valley Pipeline’s construction. The association held a meeting on Feb. 28 in Ireland, Lewis County, to discuss the pipeline’s impact. About 70 people gathered at the town’s shamrock-themed community center. After the meeting, Keaton said her organization had received calls the previous day from landowners in four counties who had been mailed letters from the pipeline company. Keaton believes the crux of the issue is West Virginia’s eminent domain law and whether it can be applied during the surveying stage of the pipeline’s development. The proposed route for the Mountain Valley Pipeline. Because the pipeline crosses state boundaries, the Federal Energy Regulatory Commission, or FERC, is overseeing its development. It’s FERC’s job to determine whether the pipeline’s benefits outweigh its adverse effects. If FERC decides the project should go ahead, a certificate of public convenience and necessity will be issued. The pipeline company can only ask a federal court to use eminent domain once that certificate is issued. But before any of that happens, the company has to submit a formal application to build the pipeline. According to its own timeline, MVP is planning to do that in October. If the application is approved, eminent domain likely wouldn’t be granted until sometime in 2016. “So we feel as though they’re putting the cart ahead of the horse,” Keaton said. Until a public convenience certificate is issued, FERC says state laws govern whether landowners can be forced to allow surveyors onto their property. But West Virginia’s laws on this issue aren’t very clear. We’ll have more on that in a minute. A few landowners at the meeting said they don’t want pipeline surveyors on their land, but are very concerned about the threat of legal action. Lawyer Joe Lovett, with Appalachian Mountain Advocates, is representing some landowners who have received the letters. We reached out to MVP for specifics about the threat of legal action. EQT spokeswoman Natalie Cox declined an on-air interview and instead issued a statement on behalf of the Mountain Valley Pipeline company. Cox said MVP is trying to work with landowners to resolve their concerns, but legal action may be necessary to move the surveying forward. She didn’t offer any details about the company’s plans for legal action. Cox did, however, emphasize the importance of conducting the surveys. MVP says those surveys will determine the route that has the least overall impact on the environment, landowners, and cultural and historic resources. Lovett, however, says it doesn’t matter how useful the surveys are to the MVP project, the letters still amount to bullying. To help us put the survey issue in perspective, we spoke with West Virginia University associate professor Jesse Richardson. He’s a land-use lawyer who has experience with eminent domain. He says because West Virginia’s law is very old and there isn’t much legal precedent for these cases, it’s not a clear-cut issue. Richardson says that all things considered, MVP could have grounds for legal action. He says it would be up to a circuit court judge whether the company has the right to survey without a landowner’s permission at this stage in the pipeline’s development. Back at the meeting, Keaton says it would be in the community’s interest to see how that legal action plays out. Keaton stressed that landowners never sign anything from a pipeline company without consulting a lawyer first. A judge says the West Virginia Department of Environmental Protection violated the state's Freedom of Information Act when it denied a law firm's request for water pollution data. Kanawha County Circuit Court Judge Charles King ordered the DEP this week to provide the data to Appalachian Mountain Advocates. 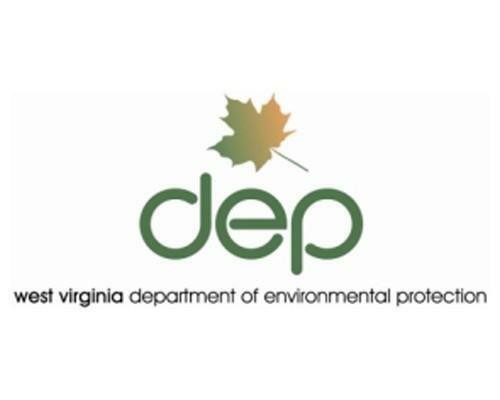 The law firm sued the DEP after the agency denied its 2013 request for the most recent quarterly data showing water pollution levels at coal mines statewide. In the past, the DEP provided similar data in a spreadsheet format.